Q: Joey, my six-year-old Pomeranian was well toilet trained but since past six months, she has forgotten everything. In fact she loves our carpet in the drawing room and relieves herself there. Please advise. Dr. K. G. Umesh: It is not unusual for dogs to have an occasional accident in the house. If this behaviour is occurring on regular occasions, there can be a number of reasons as to why. Has the pet got access to the outdoors? Is there an underlying medical cause? Is there an underlying behavioural cause? It is not uncommon for the older dog to lose some of the ability to control his bladder. There are many medical problems that can cause signs of incontinence. Some causes of incontinence can be due to urinary infection, cystitis, bladder stones or hereditary defect. Most urine related problems can be managed very successfully using drugs and/or diet. The other possibility for your dog’s house soiling is if there is an underlying behavioural cause, such as, submissive urination, stress, a breakdown in toilet training, territorial marking or separation anxiety. Once again, these behaviour problems can be modified effectively. Your veterinary surgeon will initially run few lab tests to rule out any underlying medical cause. If your dog has soiled the house, it is important that the affected area is cleaned promptly using a biological washing powder in warm water. If it is not cleaned effectively, she may mark that spot on repeated occasions. Therefore, it is best to seek veterinary advice to determine the true cause of the problem. Q: I want to bring home a Labrador. Do let me know how do I go about it? What all should I look for in the puppy and should I see the parents? 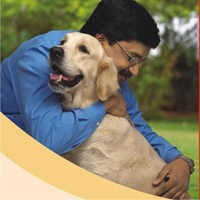 Dr. K. G. Umesh: The best place to get a purebred dog is from a recognized, reputed and ethical breeder or rescue organization who understands the character, temperament and challenges of this breed as well as what kind of home will make their dogs the happiest. Unfortunately it is difficult to find such well-organised breeders in our country. We recommend asking lots of questions about their facility, the bloodlines of their dogs, height and weight, socialization level, health record etc and the warranties/guarantees offered. Papers may be required if you intend to show your pet in a dog show or for breeding. 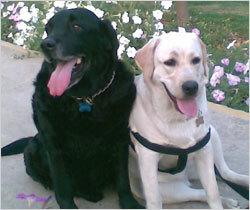 The vet may help to screen or identify common genetic/inherited disorders common to Labradors. You can also check with your local Vet or use an Internet search engine to buy a healthy puppy. Dr. K. G. Umesh: Developmental skeletal disease is common in large- and giant-breed puppies. One manifestation – hip dysplasia – affects millions of dogs. Genetics, environment, and nutrition – all contribute to developmental skeletal disease. Of the nutritional components, rate of growth, specific nutrients, food amounts consumed, and feeding methods influence skeletal disease. Excess energy and calcium are known risk factors; your vet will confirm diagnosis (Bone, Joint, Trauma or Neurological) by palpating (examination by touch) the hip joints/ legs and taking x-rays. Hip dysplasia is treated with rest, restricted activity, pain medication, and in severe cases, surgery. Dr. K. G. Umesh: Weakness can result from many different mechanisms or disorders. Poor socialization or interaction, fear or shyness or even a previous bad experience may de-motivate puppies to play or walk. Your dog may rightfully need some rest after a play or exercise. But serious conditions can also cause weakness in dogs, including joint problems (such as hip dysplasia), muscle disorders, neurological disorders, heart or respiratory disease, fever, low blood sugar levels, abnormal electrolyte levels, kidney or liver disease, hypothyroidism, hypoadrenocorticism or anaemia. Please take him to your vet ASAP. Dr. K. G. Umesh: Dogs can experience many emotions, just as humans. They may lose interest to eat or play. Some may become sluggish or tired. It may be a good idea to leave some of his belongings (blanket/lease etc) with them to sniff and remember their friend. Take them for longer walks or the park to play. Spend few minutes grooming them or play games together. Some people may want another dog, but it may not be necessary in your case. Q: What are the behaviour changes in cats with respect to climate and food? Dr KG Umesh: Cats are true carnivores. They generally prey items, which are rich in water, protein & fat and low in carbohydrate and have no requirement for plant materials. Cats can not taste sugars/carbohydrates. It is generally believed that food at body temperature is preferred by cats. Whiskas cat food has been developed considering all these feeding behaviours and enjoyment of feeding. For example, Whiskas has specific design of kibbles size and shape, texture, aroma and variety. Adult cats are grazers, feed 2-5 or more small meals per day. Whether you are feeding wet, dry or semi-moist, water is a vital nutrient. The most important part of the environment is climate, which includes humidity, temperature and photoperiod. These climatic factors or seasonal changes influence the behaviour, breeding status and immunity of animals. Animals who live in hot/cold seasons/climates are adapted to their environment. Reduced food and thus nutrient intakes can be a problem in pets in hot environment yet energy requirements may be increased to maintain normal body temperature. Therefore, it seems prudent to feed the diets with a moderately increased energy level during cold or hot climate in cats. A nutritionally balanced diet with a continuous source of fresh clean drinking water appears to confer some protection from the detrimental effects of heat stress. Q:Blacky, my seven-year-old mixed breed, weighs around 30-32 kg. She has become fat; her stomach is big and soft even though her food intake is less. She also drinks less water and her urine is yellowish in colour. Her periods are quite irregular and she has never been mated. Her liver tests are as follows: S.G.P.T: 112.0 U/L, Serum Creatinine: 0.60MG/DL and B. U. N.: 9.30 MG/DL. Please advise. A:Neoplastic or Non-neoplastic disorders may cause abdominal enlargement in senior dogs. The information and lab report provided is inadequate to make specific suggestions on either diagnosis or treatment. Therefore I would suggest complete investigations to identify the underlying cause of her problem. Q:My three-year-old Neo Mastiff, Sheeba has developed nail growth on her paw pad. I am sure it wasn’t there until three weeks ago. Is this common in dogs? What are the causes & remedies? A:There are many causes of claw and claw fold disease in dogs. Numerous diagnostic techniques can be employed to narrow the list of differentials. Because many of these diseases have similar symptoms, biopsy of the claw is often necessary to obtain a definitive diagnosis. I am not sure you are referring to extra claw or abnormal overgrowth of claw. There are dogs whose initial symptom is abnormal growth (onychodystrophy) of the claw. Once the diagnosis is established, an accurate prognosis can be given and a treatment plan is executed. A careful history is necessary to make a diagnosis of idiopathic onychodystrophy. Geriatric dogs with onychodystrophy may respond to gelatin or biotin supplementation. Q:My Dachshund puppy is four months old. What kind of care should I take so that she does not develop any back problems? A:The backbone of dogs is made up of bones called vertebrae. These bones protect the spinal cord, which extends from the brain to your pet’s tail. A pad of tough, fibrous tissue called disc is located between each vertebra. These intervertebral discs function as shock absorbers and stabilizers of the spine. In chondrodystrophic breeds like yours, the disc undergoes degeneration over time but many changes are present early in life. Disc degeneration is the main cause of the back problem but trauma is also a common cause. Dachshunds have the highest prevalence of slipped discs or disc diseases. Limiting running and jumping has been suggested to prevent occurrence, but the value of this has not been proven. Feeding balanced food and regular exercise will keep her fit and healthy. Make sure that she is not overweight or obese. Q:My dog has motion sickness; each time I take him out in the car he throws up. Please advice how do I take care of this problem. A:Travelling by car is easier for dogs; the safest way is in a crate. Many owners have discovered that an empty stomach is the best anti-illness prevention and they don’t feed their pets for up to five hours before a long car ride. It might also help to travel with your dog in his crate, if it can be securely fastened on the car’s seat or floor. The crate generally comforts your dog and gives him a place to lie down, which can reduce motion sickness. If your pet’s car sickness is truly motion related, your vet can also prescribe medications to fight travel illness. Be sure to stop frequently for potty breaks. Always keep something with your scent on it in your dog’s carrier. A piece of your clothing can be a reassuring reminder of home sweet home. Will there be any dominance issues between my old dogs and new dog? When my female dog comes on heat, what should I do? Should I also neuter my male dogs? Introduce her to other dogs gradually over period of few days with each dog on a leash. If all goes well up to this point, take the dogs for a walk, allowing them to sniff and investigate each other from time to time. Never talk to them in a way that is threatening. Reward good behaviour with treats/compliments of ‘good dog!’ and monitor their body language. If you don’t intend to breed your female dog, then you should seriously consider neutering. The most common methods of contraception are ovariohysterectomy (spaying) in female dogs and vasectomy or castration in males. Such procedures eliminate heat periods, objectionable behaviour, including spotting of blood in dogs, and the attraction of male animals. Spaying and neutering can reduce the risk of several different conditions later in life. Cats are true carnivores (meat eaters) and their diet consisting of small preys such as rodents, birds, fish, reptiles and insects. They generally prey items which are rich in water, protein & fat and low in carbohydrate & ash (minerals) and they have no requirement for plant materials. Hunting is entirely natural for cats and takes place even when they are well fed at home. There is really no point in trying to punish/correct your cat for hunting as it is part of his nature that is so deeply rooted that to try and eliminate it may cause him a lot of confusion. Playing ‘catching games’ with your cat using toys may help to relieve some of his urge to hunt. It is important to worm your cat regularly, particularly if he hunts. Consult your veterinary surgeon for more advice on worming. As cat’s nutritional needs are different to that of a dog or man, and feeding a high quality, well-balanced commercial cat food (Whiskas) help maintain optimum body weight and condition. I took out almost 70 ticks from my two dogs – Zack, a Golden Retriever and Cody, a Spaniel, who are 4 months old. Please do advice me a safe method. Is a tick bath safe at their age? Do we have spot on for puppies? Is there a vaccine for ticks- is it safe and what age can it be administered? What can I do to prevent those ticks on my puppies? To control ticks or fleas on a dog, all animals in the household must be part of the flea/ticks control programme. There are two basic categories of flea/ticks control products: Adulticides (these products kill adults fleas) and Insect growth regulators (IGRs)/insect development inhibitors (IDIs) (these products prevent fleas/ticks from hatching or maturing). Flea and tick control products for dogs include a variety of drugs and chemicals available as collars, shampoos, sprays, dips, powders, long lasting topicals, and oral medications. There are no vaccines available at present to control ticks. Thorough cleaning of the house and yard should precede any application of insecticides. Places where dogs spend most of their time will have the greatest numbers of deposited eggs and newly emerged adult fleas and ticks. It is always best to treat the dog and the environment on the same day. Make sure that other pets/dogs he frequently contact/visit are free from fleas and ticks. The veterinarian will choose a product or products that combine safety, efficacy, and ease of use for the client. Often a combination of adulticide and an IGR or IDI is used. My dog’s fur has a lot of dandruff-like thing in it and there has been a lot of hairfall. Now I don’t find new fur growing. Please help. Photoperiod (light intensity) is main factor besides nutrition, genetics and health that can cause dogs to shed hair excessively during some seasons and therefore, can be physiological. Dogs may also shed excessive hair because of stress, worms, harsh climate and general illness. Therefore, my approach would be to find underlying cause/s (like fleas, ticks, mange or allergy, hormonal imbalance, bacterial or yeast infection, etc) and then your vet will be able to recommend suitable medications that will eliminate the cause and therefore hair fall. Evening Primrose oil capsules (1 cap per day) or Sunflower oil/saffola oil/corn oil (2-4 tsp) and Zinc capsules everyday in the feed may also help him improve his hair coat in the short term when no underlying cause is identified. I have a Lab puppy (male) around three months old. What all precautions should be taken in terms of his good health? The first few months of your puppy’s life show a very rapid development, and most Labradors become adult by 12-14 months of age. Feeding your dog a well-balanced puppy diet is clearly necessary to keep him fit and healthy, and there is a whole variety of different types of products to choose in Pedigree designed for puppy and Special food like Pedigree large breed which deliver additional health benefits. Other activities such as exercise, training, grooming and regular visits to the veterinarian (vaccination and worms treatment) are equally important to keep your dog happy and healthy. My Lab pair are somewhat related. Do you think it is alright to breed them? If a dog suffers from a disease that is suspected, but not proven, to be inherited, the dog should not be used for breeding. If close relatives of such a dog are used for breeding, they should be mated to dogs from bloodlines with low or no occurrence of the same disease. Breeding of siblings or continued line breeding results in increased mortality rates. My two-year-old female Lab is very shy. She doesn’t bark back at street dogs when she goes for a walk. Some days back she was attacked by a street dog, luckily she did not get hurt but after the incident she is even more scared of the dogs and doesn’t like to go for a walk where there are dogs. What can I do to make her more confident? The best advice we can give is to pinpoint whom it is that might induce fear in your dog. This will help you avoid any unpleasant situations. Non-confident canines require very gentle training and lots of patience from their owners. One of the most common causes of shyness is the lack of exposure to new people and places at a young age. Dogs look to their owners to be the ‘alpha dog’ of their ‘pack’, and to guide them safely into new and stimulating situations. Without these experiences, the dog may become timid and skittish when introduced to things outside their immediate familiarity. She looks to you for guidance and protection, and therefore you must exhibit the level of confidence and firmness you would like your dog to follow. When your dog is frightened, it’s human to want to comfort your dog and say “it’s OK”. However, your dog assumes that you are praising her for being scared – which reinforces skittish behaviour. Shy dogs need to have repeated positive experiences with many different people. Most shy dogs can become friendly with positive human interaction. Never force your dog to do anything that makes her nervous. Consider obedience training and introduce her to strangers, dogs or places gradually. My five-year-old Spaniel is not neutered. Once when I took him for a walk, without any reason, he snarled and tried to jump at a passer by. This has happened three times in a month. Can you advice me why this sudden aggression and what can I do to remedy it? The two most common manifestations of aggressive behaviour toward humans are fear biting and dominance-related aggression. The other serious types of aggressions are possessive aggression, conflict related aggression, protective aggression, and predatory behaviour. Fear biting is most commonly seen in a dog raised without appropriate human contact during the socialization period of growth (6 to 12 weeks of age). Such an animal fears people who are unfamiliar to him, and he may attempt to bite when feeling threatened. The more he gets outside and encounters lots of other people and unfamiliar things, the less likely he will act aggressively around people. So provide your dog with a chance to socialize with people and other dogs. Take him out and spend lots of time with him. Reward him with a pat or a snack if he doesn’t react. If biting continues to be a problem, take your dog to a professional dog trainer who will work to change the behaviour. I take my pet Jugnu who is just four months old to a vet for vaccination/health problems when they arise. I wanted to know whether a six monthly overall check-up is better or should one do it annually? Also what are the things the vet will check to determine that the overall health of the pet is perfect? When you get a new puppy, you need to know about minor and major ailments, and when to consult a vet. As a puppy owner, it is recommended to visit your vet every three months, following the last vaccination and at least twice a year after reaching adult stage. The routine preventive health care procedures include complete physical examination, weight and body condition, vaccination, progress made in housetraining & behavioural training, parasite control, neuter surgery, diet/feeding suggestions and dental home care. My three-year-old Lab is always hungry; we give him dog food twice a day – morning and evening. Over the last couple of months, his appetite has increased. Is this normal? If he’s eating a lot, maybe he needs the food to fuel/match his activity level. Or it could be just that he’s bored – just like when we humans get bored and end up reaching into the refrigerator. Is he having any signs of illness? Is he losing or gaining bodyweight? Some medical problems like diabetes, pancreas insufficiency or drugs may also cause this problem. Answer to some of these questions will help to find underlying cause for his voracious appetite. Please take him to your vet. Susan, my Dalmatian, starts panting very soon when I take her for a walk. She is four years old. Should I reduce her walk time or how do I build up her stamina? If your dog hasn’t done much exercise in the past, it’s best to start off slowly. In fact, before you get your dog started on any exercise programme, you should take her to the vet first for a thorough check-up. Start off with 10 to 15 minutes a day of walking to allow your dog to build up her cardiovascular and muscle strength. Eventually, you can walk up to an hour a day – again, if it’s appropriate to her. After a few months, you both will be up for a good run. Exercise to Susan’s abilities, not yours. Make sure Susan always has plenty of fresh water before and after exercise. While reading a pet food label, what are the important ingredients that one should take note of? The ingredients list cannot be used to assess the quality of a dog food. The ingredients used should be of very high safety and quality as laid down by the regulatory bodies. The final nutrient profile of a pet food is most important factor in meeting the recommended pet’s daily nutritional needs. If the food meets your pet’s nutrient profile, it does not matter whether the sources of those nutrients are cereals, chicken by-products or soyabean. The ingredients do however affect taste and hence most pet foods are designed to be very palatable (using tested and established ingredients). Knowing ingredients list matters only when a pet has ‘allergy’ to a particular ingredient. The incidence of true food allergy in pets is not exactly known but very low as per scientific publications. It is a frequently overestimated problem by pet owners. Keep out of your Dog’s reach!